The Super Bowl is going to be coming up soon - Sunday, February 6th - and perhaps, you are hosting a party or maybe you're just going to one? Either way, it is traditionally a game watched while consuming tons of food. You may have decided that you'll just make food that you cannot eat for your guests or if you're going somewhere, plan to eat beforehand. Well, this year you don't have to do that. I will tell you some easy steps on how to host your own exclusively Gluten Free Super Bowl party that even those on a regular diet will enjoy! Or if you are attending someone else's party, you can just bring with you one or more of these items. The above gluten free items can be found at most major supermarket chains along with select health food stores. You may also want to check out Ms. Celiac's Market's Super Bowl section for additional items. One of the great things about being on a gluten free diet is that it encourages you to explore new foods that you otherwise may have never tried. The other day I made 3 delicious gluten free Spanish-themed recipes. This included the classic Gambas al Ajillo, Guacamole, and Plantains in Thyme and Garlic. Each item turned out more delicious than the next and everything was very easy to make! In a medium bowl, combine avocados and lime juice. Mash until you reach desired consistency. Cut the tips off each end of the plantains and remove the skin. In a large skillet, bring the water to a boil over medium heat. With a slotted spoon, remove plantains from skillet and onto paper towels to dry. In a large bowl, combine the thyme, paprika, and salt. Add the plantains and toss. Add the olive oil to the skillet and heat over medium-high heat. Add the plantain slices. Cook until they are golden on the bottom (approximately 3 minutes). Flip sides. Scatter garlic over the plantains. Cook another 3 minutes. In a large skillet, heat the olive oil, garlic and chili flakes over low-medium heat. When oil starts to bubble, add in the shrimp. Sprinkle with sea salt. Cook for 1 minute and then turn over and cook for another minute. Remove the shrimp from the pan and wipe pan dry with paper towels. Add 2 tbsp olive oil to the pan and turn to high heat. Return the shrimp to the pan and cook for about a minute on each side until just browned. Gluten-Free recipes with "View" cohost Elisabeth Hasselbeck; allergen-friendly kettle corn with entrepreneurs Angie and Dan Bastian. Check your local listings for the exact time this will be airing near you! Gluten free food, in general, lacks fiber. That is why Bakery on Main took it upon themselves to create a gluten free product that was not only high in fiber but delicious too! Fiber Power is their new line of high fiber gluten free granola. It contains 9 grams of fiber per serving! The product gets its' fiber from two sources - whole grain certified gluten free oats and prebiotic Inulin fiber from Jerusalem artichokes. In addition to being gluten free, this product is also dairy free, casein free, trans fat free, cholesterol free, low in sodium, low in saturated fat, all natural, and certified Kosher Parve (OU). It is currently available in Cinnamon Raisin and Triple Berry varieties. All of Bakery on Main's products are made using only the best whole nuts and unsulfured dried fruits. They are manufactured in a plant that is certified gluten free by the Gluten Free Certification Organization. Their products are also free of trans fats, cholesterol, dairy, and casein and are certified Kosher Parve (OU). Please visit their website, www.bakeryonmain.com, where you can join their "Eat Better Live Better" club. Upon joining, you will receive a $1.50 coupon and will also be sent the latest recipes, coupons and special offers. Bakery on Main products are available at select health food stores and major supermarket chains. You may purchase the Gluten Free Granola and the Gluten Free Granola Snack Bars at Ms. Celiac's Market. For more information, please visit them at Bakery on Main. I was lucky enough to be sent samples of Elisabeth Hasselbeck's gluten free nogii bars plus her soon-to-be-released men's nogii bar! Over the years, I have tried out practically every gluten free nutrition bar on the market from Larabar's to thinkThin bars and everything in-between. Although, I did enjoy some of these bars, I always felt like each bar was lacking in some way - whether there was barely any protein in the bar, it was made of mostly artificial ingredients, or it just didn't provide the nutrients I needed. So, you can imagine how thrilled I was when I heard about the nogii bar. It is high in protein (20 grams), I recognize every ingredient on the label, and it is nutrient dense - containing 10% Iron and 10% Calcium! However, the best part is that the nogii bar is delicious and filling! It has a strong "peanutty" taste, a chocolate-coated bottom with chocolate drizzled over the top! It is sweet, but not too sweet and tasted more like a dessert than a healthy nutrition bar. And unlike many of the gluten free bars on the market that leave you starving soon after eating, this kept me satisfied for several hours afterward. Living on a gluten free diet, we have all been in situations where we need to be out the entire day and know that there will be no place to buy gluten free food and we can't exactly be carrying around a cooler containing our gluten free meals or taking the time to prepare a gluten free meal. In the past, I have carried around other gluten free bars that have left me with a headache and feeling faint by the end of the day - not to mention absolutely starving as if I had been fasting all day! Now, I will be sure to carry around the nogii bar, so that I have the energy to complete a busy day! I was also able to sample the Men's nogii bar. This bar contains 30 grams of protein and 15% Calcium and Iron. It was also delicious! Currently, the only bar available is the Peanut Butter & Chocolate All-Natural High Protein nogii Bar. You can purchase it at Ms. Celiac's Amazon Marketplace or at Smoothie King locations. Coming soon you will also be able to purchase the Men's Chocolate Peanut Butter Caramel Crisp All-Natural Super Protein nogii Bar and the nut-free nogii Kids Bar. To stay up-to-date on the latest nogii products, please visit www.nogiidiet.com and subscribe to the email newsletter! Popcorn Indiana has introduced a brand new snack to the marketplace! Chip'ins are a combination of popcorn and chips! The delicious taste of popcorn with the crunch of a chip is the end result! Chip'ins are a gluten free, all natural, whole grain snack! They contain zero trans fats and have no cholesterol, artificial flavors and/or preservatives. You can purchase Popcorn Indiana's Chip'ins at Costco, Wal-Mart, and Walgreens or by visiting their website at www.popcornindiana.com. The gluten free diet does not always provide the healthiest options. In fact, you have to be careful that you are getting all the nutrients that you need and not loading up on too many gluten free breads/cookies/cakes/pastas that have very little nutritional value and many calories. Below are two delicious and healthy gluten free recipes that I tried out recently! They were both also very easy to make. So, give them a try and let me know how they turn out for you! On a large plate, combine the gluten free flour, 1/2 tsp of the oregano, and salt. After cleaning off the turkey, place the cutlets in the flour mixture, dusting both sides. In a large skillet, heat the EVOO over medium-high heat. Add the cutlets and cook for approximately 4 minutes on each side. Once they are fully cooked, transfer to a plate. Now, add the garlic to the skillet and cook until fragrant (about 15 seconds). Add the gluten free chicken broth, lemon juice, and remaining oregano to the skillet and cook, stirring frequently, for 3 minutes. Pour the sauce over the turkey and serve! Lightly grease a 9-inch glass pie plate. Place the artichokes in a colander and rinse under cold water to separate, then dry with paper towels. Place artichokes in pie plate and toss with the lemon juice. In a small bowl, combine the gluten free bread crumbs, cheese, herbs, garlic, and oil. Mix well. Sprinkle the mixture evenly over the artichokes. Bake until the top is golden, approximately 20 minutes. Elisabeth Hasselbeck releases NO GLUTEN nogii bars! Elisabeth Hasselbeck, co-host of the View, an ABC News Contributor and author of the New York Times bestselling book, The G-Free Diet, has created a series of nutritious gluten free bars! The first of which is the nogii High Protein Peanut Butter and Chocolate Bar! In addition to being gluten free, this all natural bar contains 20 grams of protein and is a healthy combination of protein, fats, and carbs. It contains absolutely no trans fats, no hydrogenated oils, and no high fructose corn syrup. If you are looking for a quick and convenient nutrient-dense meal, this seems like a great option! "The day is busy; the demands are high. Whether I am training for a 5K race, pushing through a long day of work, or getting the kids from school to practice and back--I rely on nogii bars to keep me fueled, energized, and ready to tackle it all! I created the nogii bar as a solution to my search for a lower-calorie, NO-GLUTEN, NO-GUILT, HIGH-PROTEIN (20G), ALL-NATURAL meal on the go with quality carbs for sustained energy. It goes wherever I go." Coming soon, she will also be releasing a Super Protein Bar (30 grams) specifically formulated for men and a nogii Kids gluten free bar! You can currently purchase the nogii High Protein Peanut Butter and Chocolate Bar in a 12-count package at Ms. Celiac's Amazon Marketplace! For more information on nogii bars, please visit nogiibar.com! Are you looking to start out the new year in a healthy way? 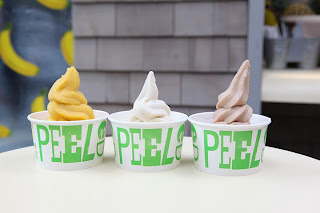 Well, if you live in NYC you should visit Simply Peeled! Simply Peeled makes a gluten free product called Fruizo! Fruizo consists of only 3 ingredients including: real fruit, filtered water, and a touch of organic cane sugar! It is a 100% natural snack that is free of dairy, gluten, fat, sodium, cholesterol, and all 8 major allergens. Even better, a small cup contains less than 90 calories! To top off your Fruizo, choose from many toppings all of which are free of nitrates, coloring, additives, preservatives and, often, are organic! They also deliver within NYC! For more information, visit their website at www.peelednyc.com! I recently came across a delicious brand of gluten free cheese crackers called Wellaby's! They reminded me of the Cheez-Its I used to consume as a child. 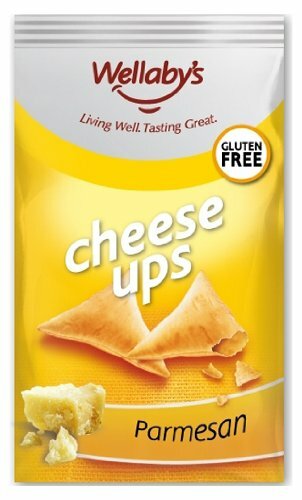 I did some research on this company and found out that, in addition to their gluten free crackers (mini and regular), they also make a product known as "Cheese-Ups." Cheese-Ups are available in 3 varieties including classic cheese, parmesan, and smoked cheese. In fact, this is the only product in the world made from 43% real cheese! Both their mini crackers and regular crackers contain 24% real cheese and are still very cheesy! Their mini crackers are available in 3 varieties including original cheese, red cheddar, and grated parmesan, while their regular crackers are available in 4 varieties including classic cheese, feta, oregano & olive oil, parmesan & sun-dried tomato, and rosemary & onion. In addition to being gluten free, all of their products are baked and not fried and contain no MSG. They are also a good source of calcium and are made in a dedicated gluten free facility! Wellaby's products are made in Greece and available throughout the world and at Ms. Celiac's Market! For more information on these products and on where to purchase them, please visit their website at: www.wellabys.com.